Oooh this is delicious. I got this recipe from my mom a few months ago and it has become a favorite! I could eat it at least once a week. And it's so easy. Go out and get some zucchini and make it. 2. While pasta is cooking, heat butter and olive oil in a large skillet (I use cast iron) over medium heat. 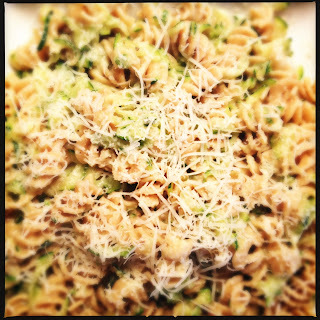 Add shredded zucchini, crushed garlic, red pepper flakes, and salt & pepper to taste. Cook for about 5-7 minutes, stirring frequently. Note: you can cook the zucchini for as long or as little as you like, depending on your taste. I like mine cooked until soft so I usually cook for 7 minutes. 3. While pasta is cooking, reserve about a cup of the pasta water and set aside. A glass measuring cup works best. Just be careful, it’s hot! 4. Drain pasta and put into a large bowl or back into the cooking pot. Add cooked zucchini mixture and stir into the pasta. Start by adding about 1/4 cup of the pasta water. Add all the shredded parmigiano reggiano cheese and stir. Add more pasta water, little by little while stirring, until you have reached the desired creaminess. 5. Serve on a large plate and garnish with more shredded parmigiano reggiano.